CSXT Intermodal ensures that all customs requirements are met when shipping cross-border freight. There was some uncertainty over the future of the North American Free Trade Agreement (NAFTA) ever since President Donald Trump took office. The president repeatedly threatened to pull the U.S. out of the agreement, and then claimed he would pursue a pact with Mexico and leave Canada out. Those fears were allayed in early October when the three NAFTA partners announced the United States-Mexico-Canada Agreement (USMCA). 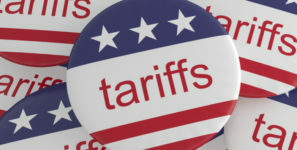 The deal still must be signed by the parties and ratified by their legislatures, but all indications point to a continuing North American trade agreement going forward. That’s important for companies that benefited from the integrated North American supply chains that NAFTA galvanized. The automobile manufacturing industry is a prime example of how NAFTA contributed to the development of truly North American products. Trucks carry 63 percent of U.S.-NAFTA freight and are the most heavily utilized mode for moving goods to and from both U.S.-NAFTA partners. Rail is the second largest mode by value, moving 15.5 percent of all U.S.-NAFTA freight, followed by vessel, 6.4 percent; pipeline, 5.7 percent; and air, 3.7 percent. Trade among the U.S., Canada, and Mexico would no doubt have continued without a new trade agreement or any trade agreement, but the advent of USMCA means that supply chains will be able to operate much as they did before. With that established, manufacturers want to know, “Which transportation and logistics providers are best to get products and components crossborder?” Here is a selection assembled by Global Trade. BNSF Logistics, a wholly owned subsidiary of Burlington Northern Santa Fe LLC, has been beefing up its North American capabilities in recent years, on both sides of the border. The multi-modal 3PL recently announced the formation of a new subsidiary in Mexico, BNSF Railway Servicios de Logistica, a move which further strengthens BNSF Logistics’ service offering across North America. The creation of Logistica, based in Monterrey, Mexico’s third largest city, will provide BNSF Logistics with additional local resources to support Mexico-based customers. BNSF Logistics in recent years has acquired Albacor Shipping., Inc., a Toronto-based company, and the Texas-based EP Team, an air cargo specialist, providing the company with project cargo expertise. “Industrial and project cargo is playing an important and growing role internationally,” notes Greer. Much of BNSF Logistics’ industrial products business has been in moving equipment for the oil and gas and wind energy industries. Landstar System, Inc., a worldwide, asset-light provider of integrated transportation management solutions, has provided Mexico crossborder services out of Laredo since 1999, and has moved its operations to a new expanded logistics center. The 31,000-square-foot facility, located on a 50-acre site, accommodates 450 trailers and provides room for future expansion. The Landstar U.S./Mexico Logistics Service Center features a highly secured C-TPAT certified site, including a 30-bay cross-dock and transload facility, along with a dedicated platform and heavy/specialized freight area with a custom 120-ton, stand-alone bridge crane. The logistics center is one of the largest facilities of its kind in Laredo. The new yard has a custom-designed 120-ton stand-alone bridge crane to accommodate the ability to transload many of the largest super loads. “The crane is used to transfer oversize, heavy and specialized loads between various types of platform equipment coming to and from Mexico,” explains Steve Wisnieski, vice president of Mexico Operations at Landstar Transportation Logistics. Schneider was one of the first U.S. asset-based carriers to expand to both Mexico and Canada, boasting substantial presences in both countries since the early 1990s. Last year, the company announced it obtained the OK for streamlined customs clearance moving to Kansas City Southern Railway’s intermodal terminal near Mexico City. Schneider has also introduced intermodal service between the Southeast and Montreal on a route that bypasses the Great Lakes states. Intermodal’s traditional selling point has been the trade-off between slower transit times and lower costs, but that analysis doesn’t always hold water when it comes to North American crossborder trade. “In some cases, the costs of intermodal are the same as over-the-road if you are going to or from a location with constrained capacity,” says Jim Filter, Schneider National’s senior vice president and general manager for Intermodal. The trade imbalance between Mexico and the U.S. means there is cost to relocating capacity to Mexico for northbound shipments. That’s why Filter has found that intermodal shipping rates northbound from Mexico to the U.S. are comparable to trucks. The same analysis doesn’t apply to the U.S.-Canada intermodal lane, according to Filter, because of the greater relative balance in trade between those two countries. Werner Global Logistics is an asset-based logistics services provider and a division of the well-known trucking company. The company recently added Werner Final Mile services that accommodates deliveries for eCommerce customers throughout North America. Werner provides trucking services from the U.S. to Mexico with its own assets, from loading to crossing border to delivery into the interior of Mexico. The railway’s Valleyfield terminal, 40 miles outside of Montreal, provides shippers additional capacity when shipping freight between the U.S. and Eastern Canada. Opened in late 2014, Valleyfield delivers intermodal access to Canadian distribution and consumption markets. Valleyfield provides on-site border clearance capabilities, facilitated by a 10,000-square-foot, secure container processing facility and access to the Canadian government’s VACIS truck scanning system. This machine is brought on site as required and is capable of more than 25 scans per hour of an entire vehicle to clear freight into Canada. CSXT Intermodal service between the eastern United States and Mexico is available via a service called Streamline Passport, a door-to-door solution for shippers to more than 100 Mexican locations. Passport rates include all border fees, fuel surcharge and container per diem charges in Mexico. CSXT Intermodal ensures that all customs requirements are met when shipping cross-border freight. KCS is the primary rail carrier handling rail shipments to and from the U.S. and Mexico, and its investments in recent years have gone a long way to make U.S.-Mexico cross-border rail quite seamless. Shippers on the KCS enjoy customs pre-clearance—which means that shipments are delivered directly to their destinations without a stop at the border—for faster service than trucks can offer. The railway’s Mexican arm, Kansas City Southern de Mexico (KCSM), in partnership with Canadian National Railway, provides trans-border services that allow intermodal shipments to cross into Mexico prior to being inspected. The new inspection points are located in Mexico City at KCSM’s Puerta Mexico Intermodal Terminal and Terminal Ferroviaria de Valle de Mexico’s (TFVM) Pantaco Intermodal Terminal. Last year, Kansas City Southern CEO Patrick Ottensmeyer joined U.S. and Mexican customs officials in the dedication of a new Unified Cargo Processing facility at the Laredo, Texas, railroad border crossing. In addition to sharing security technology and processes between U.S. and Mexico officials, the new facility streamlines the documentation review of northbound trains and conducts Mexico export processing at the U.S. railhead.